Explore African American history through its rich musical performance traditions! Plus, enjoy late-night access to our exhibitions Black Citizenship in the Age of Jim Crow and Betye Saar: Keepin’ It Clean. Inspired by the Big Band Era of Jazz, Dandy Wellington and His Band have taken the sounds of the 1930s and ‘40s and created a world of well-dressed music. With a passion for obscure songs steeped in the Jazz tradition, Dandy Wellington has assembled a catalog of music that invokes the elegant atmosphere of the past. The program will feature the songs associated with women who have contributed incredible music, perspective, and performances to Jazz and the black American experience. Image credit: New-York Historical Society Digital Collections, Browning Photograph Collection, circa 1920-1938 › "Jazz" [photomontage of musical instruments and dancers]. 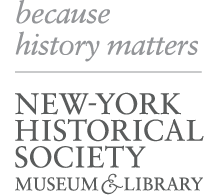 This program is presented in collaboration by the New-York Historical Society’s Center for Women’s History and Education Department.